ESMAC was formed as Enterprise Sheet Metal and Air-Conditioning in 1958 as a two- man operation. ESMAC has grown steadily over the years. The name was shortened to ESMAC in 1975. ESMAC exited the air-conditioning field in 1980 to concentrate on the roofing trade. ESMAC has installed all types of roofs over the last 50-years. We have seen numerous roofing manufacturers and contractors come and go over the last 5-decades. This experience has made us cautious in choosing the products and services we offer. We believe that if it’s not a good deal for our customer it’s not a good deal for us. ESMAC has a strong safety program and as a result low Worker’s Compensation and liability insurance premiums. These insurance policies protect our customers from damages and law suits at reasonable cost. Our mission is to provide our customers with the best roof for their investment and to extend the life of the roof through with timely maintenance. ESMAC is a Duro-Last® Master Elite contractor. Once you reach the Elite level, this surpasses Master and there is not a combined level. This distinction was granted to ESMAC for the quality of its work and sales volume over the last 15 years. ESMAC has been in business over 50 years. Over this time span, we have installed thousands of roofs and developed a reputation for superb customer service. We are especially proud of our roof maintenance and repair capability. 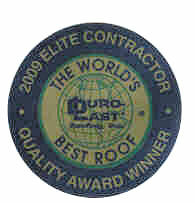 A Note About Duro-Last® Roofing DURO-LAST® advertises itself as “The World’s Best Low-Slope Roof”. After being a dealer for 15 years, we have no doubt that it’s true. DUR0-LAST’s combination of custom fabrication, ingenious accessories, tight manufacturing quality control and thorough inspection of the finished roof make their system as close to a trouble-free low slope roof that is available today. Proof can also be had by reading the DURO-LAST® non-residential warranty. It is written in simple English. Consequential (inside) damages are not excluded. I know of no other roofing manufacturer that has that much faith in their roof system.